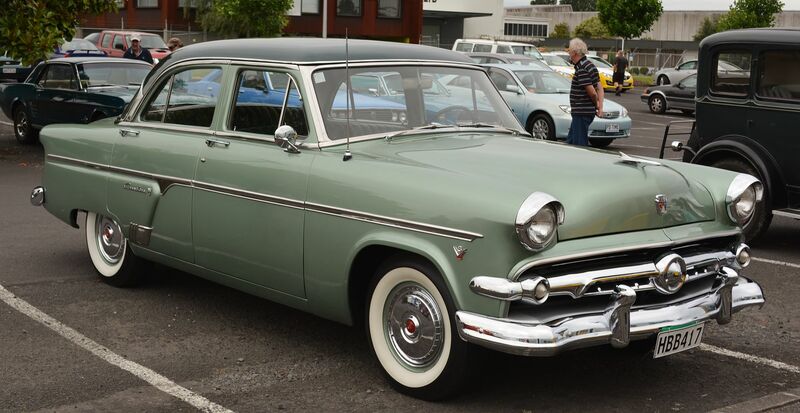 The Ford Crestline is an automobile which was produced by the Ford Motor Company in the United States for models years 1952 to 1954. 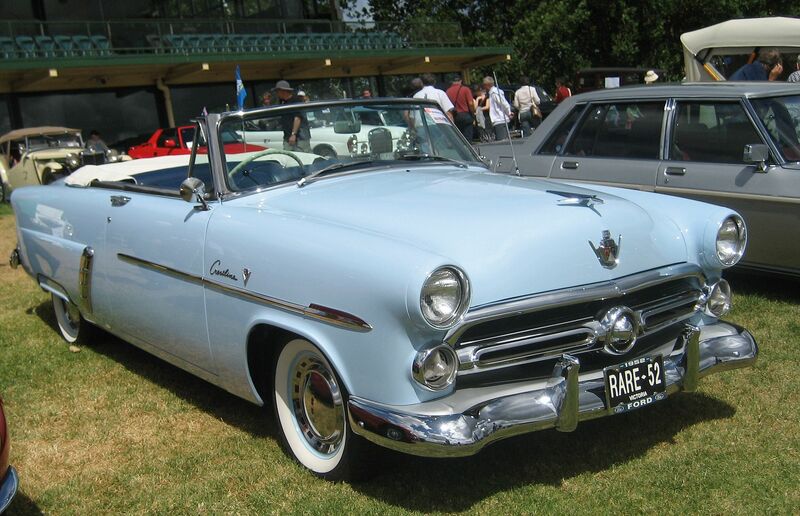 The Crestline was introduced as the top trim level of the 1952 Ford range, above the intermediate-level Customline and base level Mainline. It was offered in Victoria, Sunliner and Ranch Wagon versions with 2-door hardtop, 2-door convertible and 4-door station wagon body styles respectively. Crestlines were offered only with a 239 CID “L-head” V8 engine. The Crestline was updated with minor styling and trim changes for 1953. It retained its position as the top trim level in the Ford range while body styles and engine availability also remained unchanged. 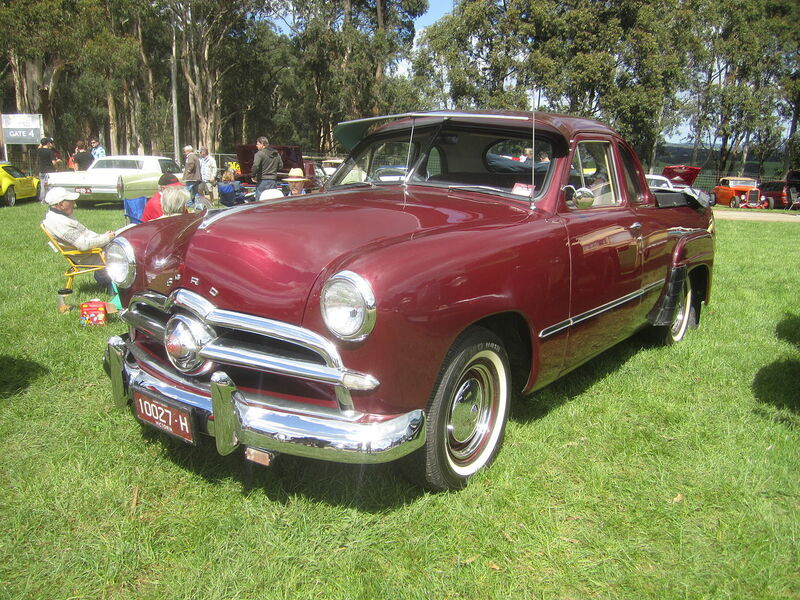 For 1954 the Crestline was again updated with minor styling and trim changes. Fordor Sedan and Skyliner versions were added, the latter being a 2-door hardtop with a tinted transparent panel in the front section of the roof. New 223 CID straight-six and 239 CID overhead valve V8 engines were offered. 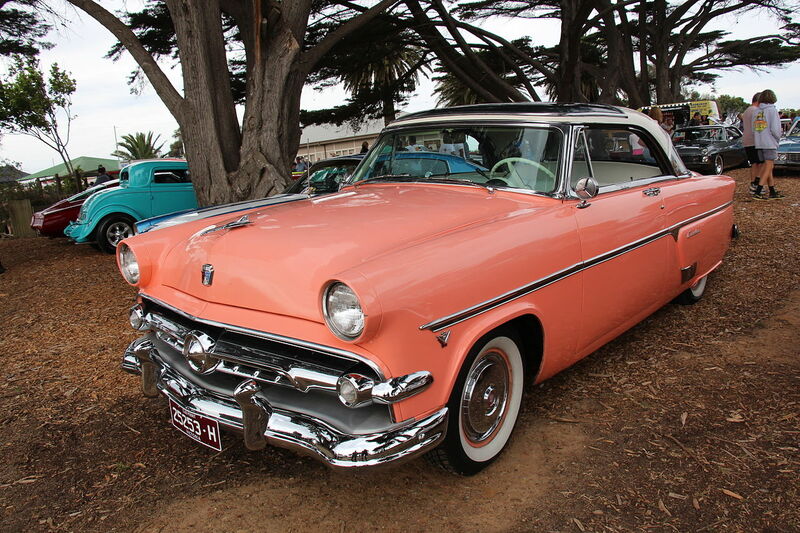 The Crestline was replaced by the Ford Fairlane in the 1955 Ford range. 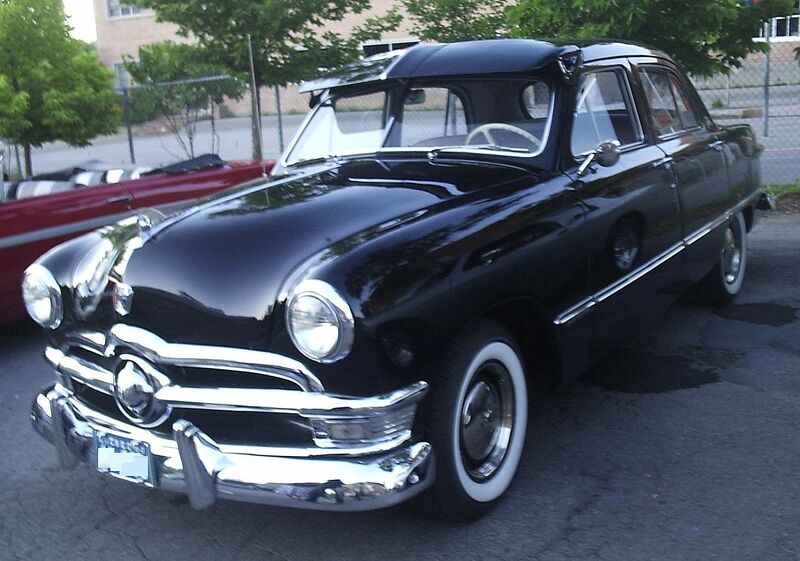 The 1949 Ford was an American automobile produced by the Ford Motor Company. It was the first all-new automobile design introduced by the Big Three after World War II, civilian production having been suspended during the war, and the 1946-1948 models from Ford, GM, and Chrysler being updates of their pre-war models. Popularly called the “Shoebox Ford” for its slab-sided, “ponton” design, the 1949 Ford is credited both with saving Ford and ushering in modern streamlined car design with changes such as integrated fenders and more . The design would continue through the 1951 model year. After sticking with its well-received previous model through model year 1948, Ford completely redesigned its namesake car for the year 1949. Save for its drive-train, this was an all-new car in every way, with a modernladder frame now supporting a coil spring suspension in front and longitudinal semi-elliptical springs in back. The engine was moved forward to make more room in the passenger compartment and the antiquated “torque tube” was replaced by a modern drive shaft. Ford’s popular 226 CID (3.7 L) L-head straight-6 and 239 CID (3.9 L) Flathead V8 remained, now rated at 90 hp (67 kW) and 100 hp (75 kW), respectively. 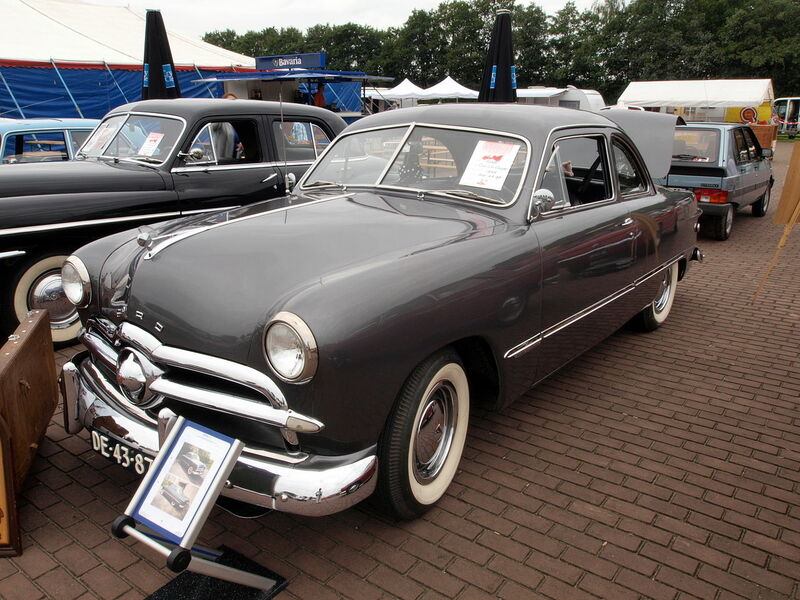 The 1949 models debuted at a gala at the Waldorf-Astoria Hotel in New York City in June 1948, with a carousel of the new Fords complemented by a revolving demonstration of the new chassis. The new integrated steel structure was advertised as a “lifeguard body”, and even the woody wagon was steel at heart. The convertible frame had an “X member” for structural rigidity. From a customer’s perspective, the old Custom, De Luxe, and Super De Luxe lines were replaced by new Standard and Custom trims and the cars gained a modern look with completely integrated rear fenders and just a hint of a fender in front. The new styling approach was also evident in the 1949 Mercury Eight and the all-new Lincoln Cosmopolitan. 1950 saw a new Crestliner “sports sedan”—a 2-door sedan with 2-tone paint intended to battle Chevrolet‘s popular hardtop coupe of 1950. Another new name was Country Squire, which referred to the 2-door wood-sided station wagon. All wagons received flat-folding middle seats at mid-year, an innovation that would reappear in the minivans of the 1990s. 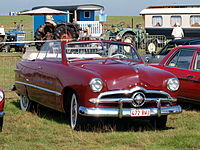 The 1949 and 1950 styling was similar, with a single central “bullet” in the frowning chrome grille. In the center there was a red space that had either a 6 or 8 depending if the car had the six-cylinder engine or the V8. The trim lines were renamed as well, with “Standard” becoming “Deluxe” and “Custom” renamed “Custom Deluxe”. The new Fords got the now-famous “Ford Crest” which appeared on the division’s vehicles for many decades in one form or another. 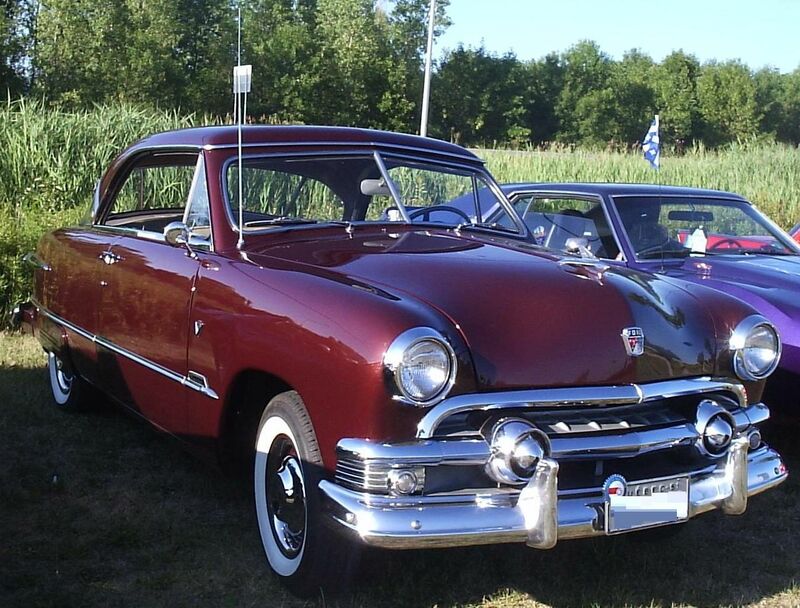 In 1950, Ford also manufactured a lesser known Business Coupe. 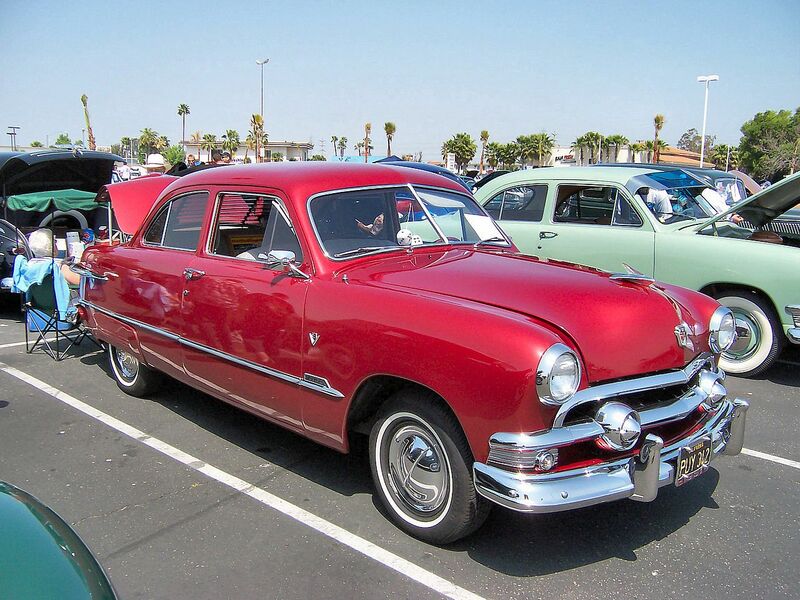 The 1951 Fords featured an optional Ford-O-Matic automatic transmission for the first time. 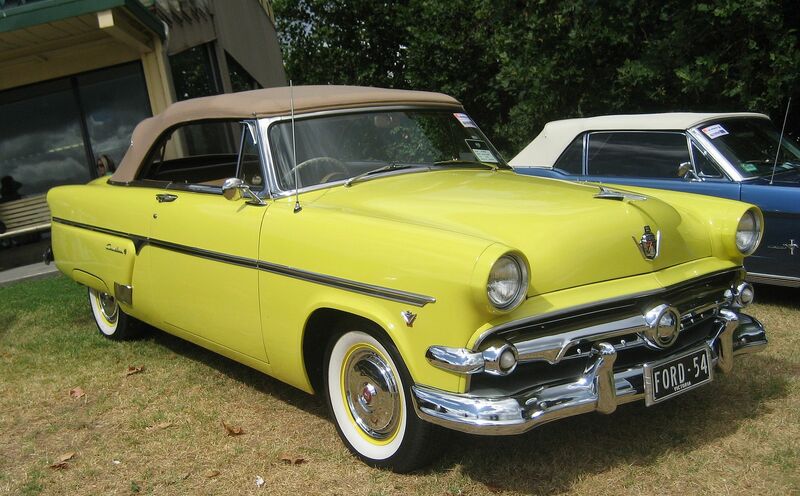 Ford finally answered the Chevrolet Bel Air charge with the Victoria hardtop in 1951. The car was an instant hit, outselling the Chevy by nearly 10%. The Crestliner continued for one more year, however. 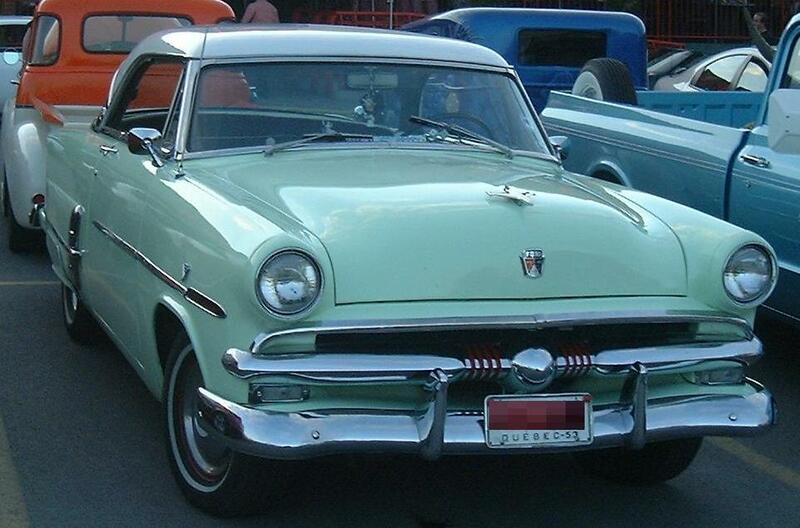 All 1951 Fords sported a new “dual-bullet” grille and heavy chrome bumpers. This year Ford also added a new “turn-key” ignition. Front suspension is independent coil springs. Head room was 36.1 inches. 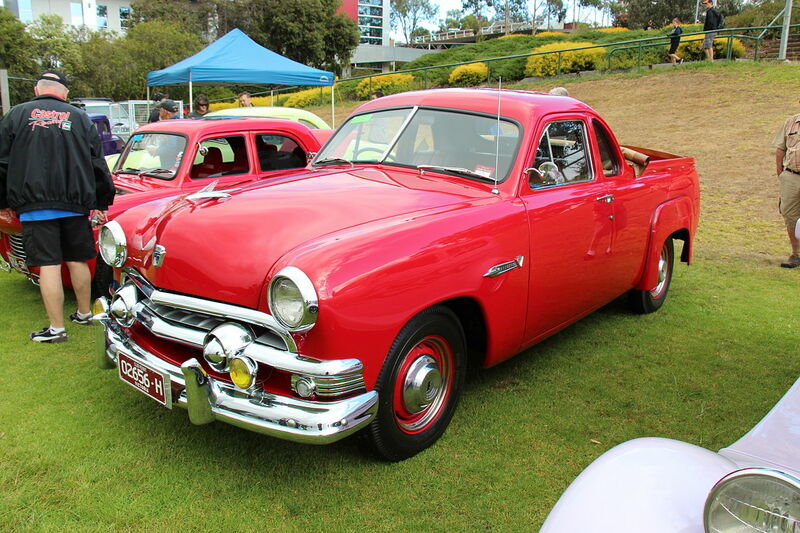 The 1949, ’50 and ’51 V8 models were also produced in Australia, offered in 4-door sedan and as a 2-door coupe utility body styles. The coupe utility was a uniquely Australian variant, developed by Ford Australia. Australian content on the locally produced models had reached 80% by 1950.